The Keno ego e cigarette clearomizer is a bottom dual coil clearomizer that's a great choice if you're looking for superior power and great flavor. Its body is made of Pyrex glass, covered in a stainless steel shell. This gives you added protection and also a fashionable look. The mouthpiece and base are both also made of sturdy stainless steel. Along with it's attractive looks, the Keno clearomizer has several other features that make this clearomizer a perfect addition to your vaping collection. The Keno clearomizer can be completely disassembled. This means that you can take it apart for cleaning purposes or to replace the wicks to extend the life of the clearomizer. This combo comes with 2 extra dual coil wicks, giving you the capability to replace your wicks several times. We recommend picking up several more to ensure you never run out. One of the great features of our Keno Clearomizers is the fact that they are dual coil and are leak proof. This means that when your wicks burn out, instead of tossing the whole clearomizer out, you are able to replace the old wicks with fresh ones. They are eGo 510 threaded, come is several great colors: and the body itself is all one piece to make this a nearly leak proof clearomizer. 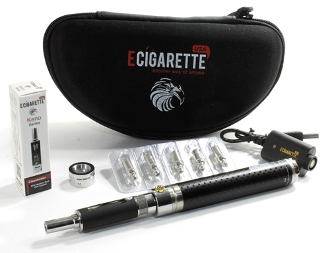 This clearomizer also has an airflow control ring located at the bottom of the tank that allows you to adjust how much airflow you receive. Unscrew wicks from the base and replace with new ones Screw the bottom assembly back onto tube.